Who was Andrew Ducarel Morrice? He appears in a sad and sobering excerpt from the Churchyard monuments survey. In memory of EMMA the beloved daughter of the Revd. ANDREW DUCAREL MORRICE and EMMA his wife. She died the 30th of Jan 1840 in her 27th year. My days are past my purposes are broken off even the thoughts of my heart. In memory of MARY MARIA the beloved daughter of the Revd ANDREW DUCAREL MORRICE and EMMA his wife. She died 30th April 1841 in her 18th year. Behold thou has made my days as it were a span long. Three graves, three gravestones, less than 18 months, daughter, wife, and daughter of just 18. I can’t imagine the grief. Why were they here? What happened? 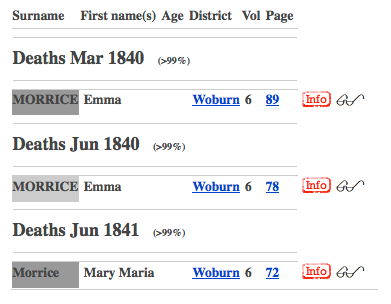 Andrew had two daughters, both of whom died in Eversholt, and eight sons, according to this family tree site. Links on that site tell that Andrew’s mother, Marie Coltee Ducarel, was a countess, was governor to the children of Clive of India, and was, allegedly, the last person to see Clive before he killed himself. Marie was daughter of Adrian Coltée, Marquis Du Carel. I [EJW] wrote to Michael Morrice, who runs that site, and he confirmed that Adrian was a Huguenot who fled France in one of the religiously-inspired pogroms against protestants. (Look, don’t get me started on how stupid it is for people who worship an imaginary god in one particular way to kill people who worship the same imaginary god in a subtly different way. I’ll only upset someone.) So Andrew seems to be the perfect sort to end up as rector of a parish with only three houses. And, by the way, there were at least two Andrew Ducarel Morrices. Andrew blessed his second son with the same name, thus earning the contempt of genealogists down the generations since. Andrew was born in 1782 in Warwickshire. Andrew rates a rather odd mention at Ancestry.com. Morris, Morrice, Andrew Ducarel, 1815 : Inst. R. Betshanger, Kent; 14, 88. 1825 : Commn. Enquiry Little Brickhill, Bucks; 14, 542. Morris, Morrice, Andrew Ducarel, 1845 : Lic. for less stipend, cur. Grove, Bucks; 16, 278. The Index to the Act Books of the Archbishop of Canterbury (and the Act books themselves do not seem to be available) says that Andrew was installed as rector of Betteshanger in 1815. The next entry is for “Commn. Enquiry Little Brickhill, Bucks” in 1825. Was he a member of a commission of enquiry? Was he the subject of a commission of enquiry? Then, in 1845, Andrew was “Lic. for less stipend” as curate of Grove, Buckinghamshire. Does that mean he took a pay cut? The next rector of Betteshanger wasn’t appointed until 1866 when Andrew died, so Andrew must have held position as rector in Kent and curate in Grove simultaneously. Presumably, neither job was especially onerous. Andrew seems to have lived in what is now Linden House but what was then Eversholt House. 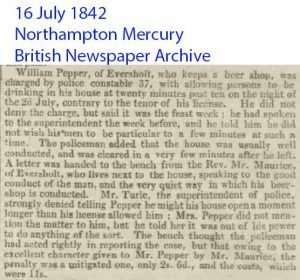 In this cutting below, he provides a reference for William Pepper at the Six Bells, and is described as “Rev Mr Maurice… who lives next to the house[the Six Bells]” and that would be Eversholt House. He would have rented it from the Sandys family. This would be in 1842, after the deaths of the women. In 1851, Andrew lived in Heath House, just along the road from the vicarage in Heath and Reach, with two servants. He gave his profession as “Curate of Grove, Bucks”. In 1861, His son, William, and family have come to stay there, although whether that was a short visit is unclear. Andrew died 30 September 1866, probably still at Heath House. He left about £4000 in his will, quite a fortune, and William was the executor. When he visited in 1861, William listed his profession as “Ship Owner, US America”. Is that the name of the ship, the US America? William was born in Great Brickhill, Buckinghamshire, about 1815, when Andrew was appointed rector of Betteshanger, so Andrew must have been in this area, long before he appears in the 1841 Eversholt census. With that as a hint, it’s possible to find him in the Clergy of the Church of England database. He is person ID 36847 there. 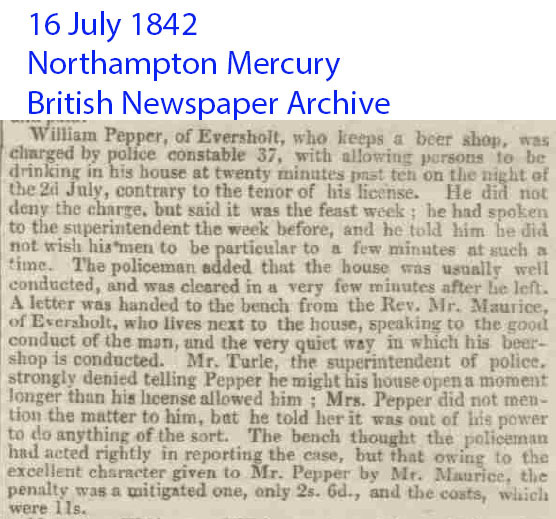 That doesn’t have other information, but does say that he was appointed curate in Great Brickhill in 1814, and for that was paid £70 per year, plus a free surplice, plus fees (for weddings?) plus a house, which was a very good wage. Agricultural labourers in Eversholt were typically earning £20 per year then, with no free house, and definitely no free surplice. That database is very frustrating, because not all the records are linked together. Here is the record of Andrew appointed rector in Betteshanger. There doesn’t seem to be a record of him at Battlesdon or Potsgrove or Grove, but that may be too late, the database only seems to go up to 1834. There’s also no mention at this list of Battlesden rectors, but that only mentions some of the curates there. There is a mention of Coltee Ducarel in the legal notes to the will of Samuel Sandys, died 1770. It was Sandys’s wife Letitia or Letithea who owned the advowson for Eversholt. Adrian Coltee Du Carel, Marquis Du Carel, is not the same person as Andrew Coltee Ducarel, lawyer. It seems they were brothers, Andrew (or Andre) being the eldest some and Adrian being younger. It seems likely that Andrew, the lawyer, was the one mentioned on the will.